When a new year starts it is common for investors and even financial experts to take what happened last year and extrapolate those results into their expectations for the new year. It’s human nature to view events as linear, when the reality is that they move in cycles. 2018 was the year of renewed stock market volatility, with many investors getting a shock at how quickly share prices can drop. 2019 started off with stocks bouncing strongly higher. The big question now is whether the 2018 Q4 drop was just a regular, stock market correction or the start of a deeper bear market. Although most “experts” tend to project the recent past into their future predictions, I expect that the trends which drive stock prices in 2019 will be different. Also, since I focus on dividend paying stocks, I look for potential among companies that pay dividends and where the economic trends could lead to nice share price gains. Here are three trends to watch out for and stocks that will benefit from the trends. The Fed may or may not continue to increase short term rates at least in 2019. Long term rates, as tracked by the 10-year Treasury Note yield have pulled back to not much higher than short rates, thus the very flat yield curve. Higher economic growth should lead to higher rates all along the yield curve. If the economy falls into recession, the interest rates will fall, and the curve will likely go inverted (shorter term rates higher than long-term rates). Companies that borrow to make loans need to be able to match their income with liabilities. A badly structured balance sheet could lead to a very bad outcome. 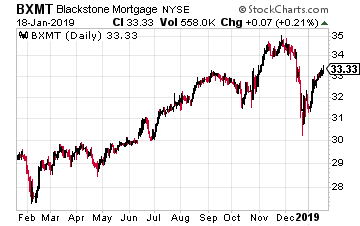 The primary business for Blackstone Mortgage Trust (NYSE: BXMT) is to make mortgage loans on commercial properties. They make loans up to $500 million on a single property, which puts them in a very small group of financial companies that will write very large loans on commercial properties. The company is structured as finance real estate investment trusts (REITs). The commercial mortgages issued by Blackstone Mortgage are retained in the company’s $13.8 billion investment portfolio.